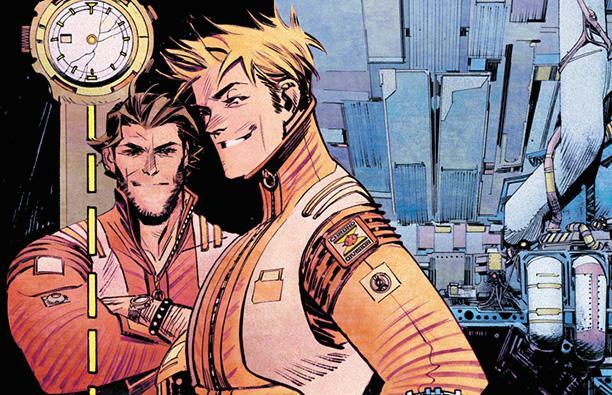 It’s going on two years since Universal Pictures last posted a status report on the movie adaptation of Mark Millar and Sean Gordon Murphy’s Chrononauts, but today brings word of what is arguably the project’s most exciting development yet. Sean Gordon Murphy and Mark Millar are also on board to produce, which ought to ensure a fairly faithful adaptation. And though Chrononauts is still simmering in the formative stages of development, the latter took to Twitter to share his dream casting: Chris Pratt and Chris Hemsworth. In fact, as Millar goes on to reveal, the genesis of Chrononauts can be traced back to the moment when an unnamed Universal executive asked him to write a pitch featuring both Pratt and Hemsworth, and the rest is history. Neither actor is currently linked with the adaptation – nor are they aware of its existence, as far as we can tell – but if Universal were to cast an A-lister in the vein of Chris Pratt and/or Chris Hemsworth, Chrononauts would surely begin to fall into place. Re Chrononauts casting – Back before it was a comic my pal at Universal asked me if I could come up with something for Pratt & Hemsworth. But this was a couple of years back and my VP pal has since moved on. No casting on the cards until a script is done and dusted. Thanks to their involvement in the Marvel Cinematic Universe (Pratt with Guardians of the Galaxy; Hemsworth with Thor) and its fantastical worlds, it’s difficult to argue with Mark Millar’s choices for Chrononauts. Whether the studio takes heed is another question entirely, but as of now, the search for Corbin Quinn and Danny Reilly continues.